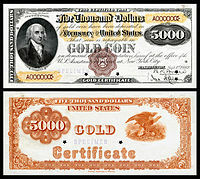 After the gold recall in 1933, gold certificates were withdrawn from circulation. As noted above, it was illegal to own them. That fact, and public fear that the notes would be devalued and made obsolete, resulted in the majority of circulating notes being retired. In general, the notes are scarce and valuable, especially examples in "new" condition. The early history of United States gold certificates is somewhat hazy. They were authorized under the Act of 3 March 1863, but unlike the United States Notes also authorized, they apparently were not printed until 1865. They did not have a series date, and were hand-dated upon issue. "Issue" meant that the government took in the equivalent value in gold, and the first several series of gold certificates promised to pay the amount only to the depositor, who was explicitly identified on the certificate itself. The first issue featured a vignette of an eagle uniformly across all denominations. Several later issues (series 1870, 1871, and 1875) featured various portraits of historical figures. The reverse sides were either blank or featured abstract designs. The only exception was the $20 of 1865, which had a picture of a $20 gold coin. From 1862 to 1879, United States Notes were legal tender and the dominant paper currency but were not convertible at face value into gold and traded at a discount. However some transactions, such as customs duties and interest on the federal debt, were required to be made in gold. Thus the early gold certificates were acceptable in some transactions where United States Notes were not, but were not used in general circulation due to their premium value. After 1879, the government was willing to redeem United States Notes at face value in gold, bringing the United States Notes into parity with gold certificates, making the latter also a candidate for general circulation. The Series of 1882 was the first series that was payable to the bearer; it was transferable and anyone could redeem it for the equivalent in gold. This was the case with all gold certificate series from that point on, with the exception of 1888, 1900, and 1934. The series of 1888 and 1900 were issued to specific depositors, as before. The series of 1882 had the same portraits as the series of 1875, but a different back design, featuring a series of eagles, as well as complex border work. 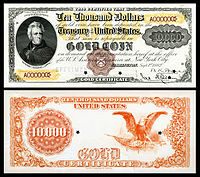 Gold certificates, along with all other U.S. currency, were made in two sizes—a larger size from 1865 to 1928, and a smaller size from 1928 to 1934. 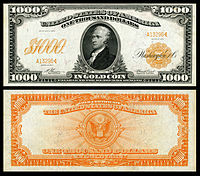 The backs of all large-sized notes and also the small-sized notes of the Series of 1934 were orange, resulting in the nickname "goldbacks". The backs of the Series of 1928 bills were green, and identical to the corresponding denomination of the more familiar Federal Reserve Notes, including the usual buildings on the $10 through $100 designs and the less-known abstract designs of denominations $500 and up. With the 1934 issue, the promise to pay was amended with the phrase "as authorized by law", as redemption was now restricted to only certain entities. The phrase "in gold coin" was changed to "in gold" as the physical amount of gold represented would vary with changes in the government price. Both large and small size gold certificates feature a gold treasury seal on the obverse, just as U.S. Notes feature a red seal, silver certificates (except World War II Hawaii and North Africa notes) a blue seal, and Federal Reserve Notes a green seal. Another interesting note is the Series of 1900. Along with the $5,000 and $10,000 of the Series of 1888, all 1900 bills ($10,000 denomination only) have been redeemed, and no longer have legal tender status. Most were destroyed, with the exception of a number of 1900 $10,000 bills that were in a box in a post office near the U.S. Treasury in Washington, D.C. There was a fire on 13 December 1935, and employees threw burning boxes out into the street. The box of canceled high-denomination currency burst open. Much to everyone's dismay, they were worthless. There are several hundred outstanding, and their ownership is technically illegal, as they are stolen property. However, due to their lack of intrinsic value, the government has not prosecuted any owners, citing more important concerns. They carry a collector value in the numismatic market and, as noted in Bowers and Sundermans' The 100 Greatest American Currency Notes, the only United States notes that can be purchased for less than their face value. This is the only example of "circulating" U.S. currency that is not an obligation of the government, and thus not redeemable by a Federal Reserve Bank. The note bears the portrait of Andrew Jackson and has no printed design on its reverse side. $10,000 Notes from this first issue are extremely rare in lower ($20 and $100) denominations. A single $1,000 and $5,000 are reported to exist in a government collection, and an issued $500 or $10,000 has never been seen. In addition to the two engraved signatures customary on United States banknotes (the Register of the Treasury and Treasurer of the United States), the earlier issues of Gold certificates (i.e., 1865, 1870, 1875, and some 1882) included a third signature of one of the Assistant Treasurers of the United States (in New York or Washington, D.C.). Known as a countersigned or triple-signature note, this feature existed for all Series prior to 1882 (and the first printing of the Series 1882). 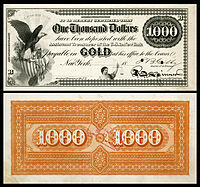 $10,000 Series 1870 notes introduced portraits to gold certificates. Both Series of 1870 and Series of 1875 are countersigned notes. 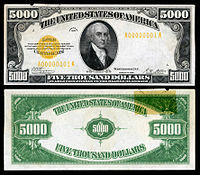 Between the two series, the $100 is extremely rare, the $500, $1,000, and $10,000 are unique (in government collections), and the $5,000 is unknown. $10,000 The Act of 12 July 1882 authorized denominations “not less than $20”. 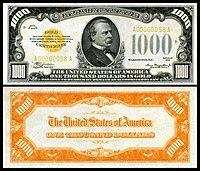 $10,000 Series 1888 notes were intended for bank use to balance accounts without having to transport large volumes of gold bullion or currency. They have all been redeemed. 1900 $10,000 Canceled -- Not legal tender. Several hundred notes exist and examples occasionally appear for sale. See above. 2401 – Woods and Mellon (1928A) – gold. 2403 – Woods and Mills (1928A) – gold. 19281928 Fr.2405 Benjamin Franklin 2405 – Woods and Mellon – gold. 19281928 Fr.2407 William McKinley 2407 – Woods and Mellon – gold. 19281928 Fr.2408 Grover Cleveland 2408 – Woods and Mellon – gold. 19281928 Fr.2410 James Madison 2410 – Woods and Mellon – gold. 19281928 Fr.2411 Salmon P. Chase 2411 – Woods and Mellon – gold. 19341934 Fr.2406 Benjamin Franklin 2406 – Julian and Morgenthau – gold. 19341934 Fr.2409 Grover Cleveland 2409 – Julian and Morgenthau – gold. 19341934 Fr.2412 Salmon P. Chase 2412 – Julian and Morgenthau – gold. 19341934 Fr.2413 Woodrow Wilson 2413 – Julian and Morgenthau – gold. Since the time of the gold recall legislation the United States Treasury has issued gold certificates to the Federal Reserve Banks. The Secretary of the Treasury is authorized to "prescribe the form and denominations of the certificates". Originally, this was the purpose of the Series of 1934 Certificates which were issued only to the banks and never to the public. However, since the 1960s most of the paper certificates have been destroyed, and the currently prescribed form of the "certificates" issued to the Federal Reserve is an electronic book entry account between the Federal Reserve and the Treasury. The electronic book entry system also allows for the various regional Federal Reserve Banks to exchange certificate balances among themselves. As of December 2013 the Federal Reserve reported holding $11.037 billion face value of these certificates. The Treasury backs these certificates by holding an equivalent amount of gold at the statutory exchange rate of $42 2/9 per troy ounce of gold, though the Federal Reserve does not have the right to exchange the certificates for gold. As the certificates are denominated in dollars rather than in a set weight of gold, any change in the statutory exchange rate towards the (much higher) market rate would result in a windfall accounting gain for the Treasury. This is a chart of some of the series of gold certificates printed. Each entry includes: series year, general description, and printing figures if available. Notes: All Series 1928A gold certificates were consigned to destruction and never released; none are known to exist. All Series 1934 gold certificates were issued only to banks and were not available to the public. The Series 1934 gold certificates are also distinguished from the previous gold certificates in their gold clause, which adds the phrase "as authorized by law" to denote that these notes cannot be legally held by private individuals, and by their distinctive orange reverses. Only a few museum specimens of these Series 1934 gold certificates survive today. The $100,000 note is the largest denomination currency ever issued by the United States. ^ Notes issued under a given Series (e.g., Series 1882, Series 1907) are, in some cases, released over a period of years, as reflected in the Friedberg number signature and seal varieties. For example, based on dates of the signature combinations, the Series 1907 $10 gold certificate was first issued with the signature combination of Vernon and Treat (in office together from 1906 to 1909) and last issued with the Teehee and Burke signatures (in office together from 1915 to 1919). Therefore, a Series 1907 note could have been issued as late as 1919. ^ There was a massive fire in a new Post Office building at the corner of 12th and Pennsylvania, in Washington D.C., on Friday, December 13, 1935. At the time, part of the 6th floor was being used for Treasury Department storage. Fire Fighters threw many boxes of documents out of the windows and into the streets below. One such box contained almost every surviving piece of the series 1900 Gold Certificates. Passersby quickly grabbed them up off the street, although all of the notes had been previously redeemed and canceled. Treasury records indicate that there are no outstanding redeemable notes of this series. ^ "Interview: Harvey Organ, Lenny Organ, Adrian Douglas". King World News. 7 April 2010. Archived from the original on 1 July 2010. ^ Friedberg & Friedberg, pp. 164–173. ^ Friedberg & Friedberg, p. 303. ^ a b Friedberg & Friedberg, 2013, p. 165. ^ Waldron, George B. (1896). A Handbook on Currency and Wealth: With Numerous Table and Diagrams. Funk & Wagnallis Company. p. 20. Retrieved 6 July 2014. ^ Friedberg & Friedberg, 2013, pp. 172-173. ^ Friedberg & Friedberg, 2013, p. 173. 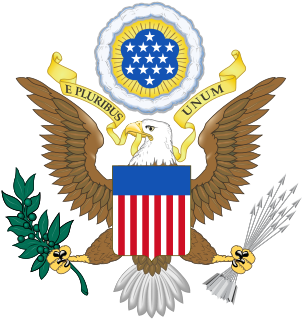 ^ "Chapter 31, United States Code". Retrieved 31 March 2013. ^ "CUSTODY OF GOLD CERTIFICATES, SERIES OF 1934, as specified by the United States Treasury". Retrieved 22 February 2014. ^ "ISSUE AND REDEMPTION OF GOLD CERTIFICATES, as specified by the United States Treasury". Retrieved 21 February 2014. ^ "GOLD CERTIFICATE ACCOUNT, as Specified by Federal Reserve System". Retrieved 21 February 2014. ^ "Federal Reserve H.4.1 Release". Retrieved 28 December 2013. ^ "USPaperMoney.Info". Retrieved 9 December 2011. This Note is a Legal Tender for All Debts Public and Private Except Duties On Imports And Interest On The Public Debt; And Is Redeemable In Payment Of All Loans Made To The United States. The United States five-dollar bill ($5) is a denomination of United States currency. The current $5 bill features the 16th U.S. President (1861-65), Abraham Lincoln's portrait on the front and the Lincoln Memorial on the back. All $5 bills issued today are Federal Reserve Notes. 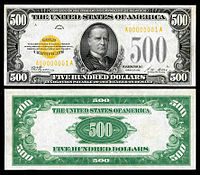 The United States fifty-dollar bill ($50) is a denomination of United States currency. The 18th U.S. President (1869-77), Ulysses S. Grant, is featured on the obverse, while the U.S. Capitol is featured on the reverse. All current-issue $50 bills are Federal Reserve Notes. The United States one hundred-dollar bill ($100) is a denomination of United States currency. The first United States Note with this value was issued in 1862 and the Federal Reserve Note version was launched in 1914, alongside other denominations. Statesman, inventor, diplomat, and American founding father Benjamin Franklin has been featured on the obverse of the bill since 1914. On the reverse of the banknote is an image of Independence Hall in Philadelphia, which has been used since 1928. The $100 bill is the largest denomination that has been printed and circulated since July 13, 1969, when the denominations of $500, $1,000, $5,000, and $10,000 were retired. The Bureau of Engraving and Printing says the average life of a $100 bill in circulation is 90 months before it is replaced due to wear and tear. National gold bank notes (NGBN), issued by nine national gold banks in California in the 1870s and 1880s, were national bank notes redeemable in gold. Printed on a yellow-tinted paper, six NGBN denominations circulated: $5, $10, $20, $50, $100, and $500. A $1,000 NGBN was designed and printed, but never issued. During the issuing period of national gold banks (1871–83), the U.S. Treasury issued 200,558 notes totaling $3,465,240. Today, national gold bank notes are very rare in the higher denominations with condition generally falling in the good to fine range. Approximately 630 NGBNs are known to exist, and roughly 20 grade above "very fine". 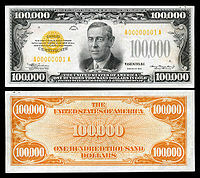 The Series of 1928 was the first issue of small-size currency printed and released by the U.S. government. These notes, first released to the public on July 10, 1929, were the first standardized notes in terms of design and characteristics, featuring similar portraits and other facets. These notes were also the first to measure 6.14" by 2.61", quite a bit smaller than the large-sized predecessors of Series 1923 and earlier that measured 7.421 8" by 3.125"
Bills of credit are documents similar to banknotes issued by a government that represent a government's indebtedness to the holder. They are typically designed to circulate as currency or currency substitutes. Bills of credit are mentioned in Article One, Section 10, Clause One of the United States Constitution, where their issuance by state governments is prohibited. The United States two-dollar bill ($2) is a current denomination of U.S. currency. The portrait of Thomas Jefferson, the third President of the United States (1801–09), is featured on the obverse of the note. The reverse features an engraving of the painting Declaration of Independence by John Trumbull.